The Carlisle 4156809 floor squeegee head is made with a synthetic rubber, double-foam blade and a polypropylene frame. With a straight design, this Sparta Brush line model can thoroughly clean uneven surfaces like grouted tile. It measures 24 inches long and is designed not to bend or rust. 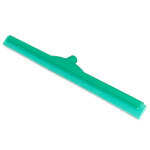 This green squeegee head is recommended for use with Carlisle handles from the 40225 series, as well as 028-40271 and 028-45267, which must be purchased separately. Note: Handle not included. Recommended for use with Carlisle handles 40225, 40271, and 45267.